The Domesday Book recorded two water-mills in the Manor of Wingham which were situated in the present village of Wingham, where there was, and still is, running water. The Manor of Wingham was owned by the Archbishop of Canterbury and his tenants in and around Nonington would have been obliged to use his mills to grind their corn, probably paying from one tenth to one sixteenth of their grain for the privilege. 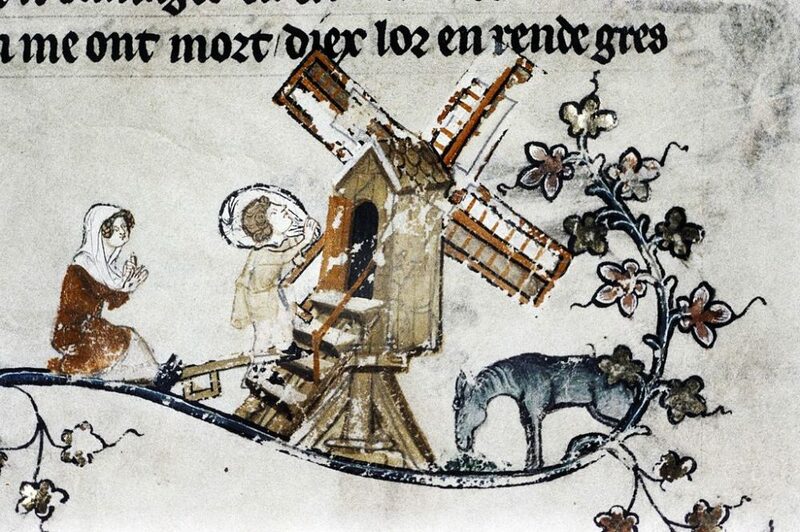 Wind mills began to appear England from the 12th century probably introduced by Crusaders returning from the Holy Land. Illustrated medieval manuscripts, carvings, and stained glass show something of how these early small mills appeared. In the late 14th century Geoffrey Chaucer, who had connections with the Manor of Soles in Nonington, described the miller in his Miller’s Tale as having ‘a thombe of golde’, possibly an ironic comment on the alleged practice of millers pressing their thumb heavily on the scales to increase the weight and therefore the price charged. The miller’s thumb was also said to be broad and flat due to the practice of rubbing flour between the thumb and fore finger to test it’s texture and quality. Miller’s, although in the main part honest men, had a bad reputation for retaining excessive amounts of grain or flour in payment for their services. By 1400 there were about 10,000 mills in England, mostly in the drier wheat growing areas of Kent, Sussex and East Anglia, and by the end of the century payment in kind to the miller had largely been replaced by monetary payments although payment in kind continued until 1796 when a law was introduced to make money payments compulsory and for mills to display their charges. 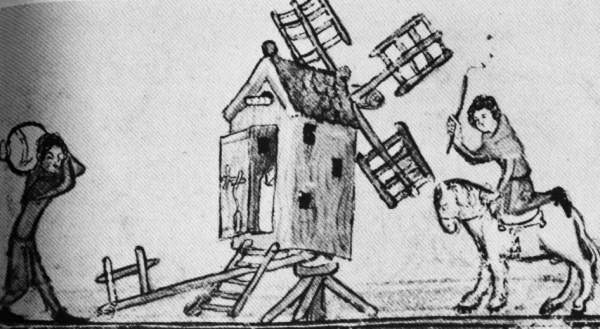 There were two common types of windmill, the post mill and the smock mill. The type oldest type of windmill was the post mill which was built around a central post allowing the whole mill to be turned into the wind to power the sweeps. There is a good example of a post mill at nearby Chillenden where the present mill was one of the last post mills to be built in Kent. It was built on the site of a previous mill and parts salvaged from the old mill, and, so it is said, other demolished Kent post mills were used in its construction in 1868 by Holman’s of Canterbury. Smock mills are reputed to have gained their name from their likeness to the linen smocks that were once the traditional dress of the British countryman. They are usually built on an octagonal brick base and clad in weatherboard, although there are examples of six, ten and even twelve sided mills. The brick base was to protect the bottom timbers of the mill from rotting, a major disadvantages of any timber construction resting on the ground. A pivoting wooden cowl with sweeps on the front and controlled by a tail fan moved independently of the main structure so that the sails could readily be positioned towards the wind. Until the recent Nonington was believed to have had three recorded windmill sites: one near Barfeston and two near Easole. The best known locally was the smock mill known locally in my childhood as Gasston’s Mill which was prominent at the top of Mill Lane until it sadly burnt down in early May of 1965. Some hundred yards or so down the track next to Gasston’s Mill, now a footpath to Kittington, was a seed mill which was badly damaged in a storm in 1905. All that now remain after the mill’s subsequent demolition are some still visible circular foundations. Some half a mile or so along the Barfreston road from the Easole mills stood a pair of windmills which were only just inside the Nonington parish boundary on the north-west side of Barfreston cross-roads as the road actually is the parish boundary. All that now remains of these mills is the name, Mill Field, given to the field to the west of the site. In case you’re interested my ancestor was John Culverhouse who when he married in St Margaret’s Canterbury on 26th September 1706 was described as “of Chillenden, miller”. I have his will dated 1725 but by this time he had presumably moved away from Chillenden as he was buried at Wye (he was also described as “of Lympne” in his will). He married a Margaret Allen whose first husband was described as a miller in Wye at the time of his death in 1706. It is possible the mill was built by Holmans but its not recorded. The crude nature of the mill suggests it might have been constructed by an estate carpenter. It replaced a very old open trestle post mill which was remembered by an old lady in the 1920s. There is even a rumour that that mill was blown down, and rebuilt by the owners of Knowlton court. The mill is at the end of an avenue of trees from Knowlton, and its possible that they funded the rebuilding as a visual feature. It certainly did a trade though. The mill could well have been put together by an estate carpenter, I have heard that the mill was second hand, at least in part, and came in from another site. I’ve also heard that the mill was put up as a visual feature to be viewed from Knolton Court, but when it was erected in the 1860’s I don’t think it was on land belonging to the Knolton estate, I think it was part of the Goodnestone estate. My understanding is the mill site predates the building of the present Knolton Court house. The previous mill site had been part of the St. Alban’s estate in the neighbouring parish of Nonington which owned land in Chillenden parish and was part of an exchange of land between the St. Alban’s and Goodnestone estates in, I believe, the 1850’s. The Chillenden mill is about half a mile from the end of the avenue leading from Knolton Court to the Sandwich road. I think I’ve heard that the mill had older structural timbers in it, with a seventeenth century date. This is not that unusual in windmills, and in this case I imagine they were from the previous mill, but not necessarily. I’m slowly writing a second volume of a book on Kent which will cover this east Kent area and Chillenden is a mystery I’d love to solve. Solley was possibly related and or the owner of Solley’s Mill at Preston. I’ve never really looked into windmill outside of Nonington, but I think the stump mill at Rowling refers the old mill on the site of the present Chillenden Mill built in 1868. 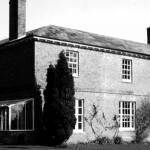 Rowling Farm and cottages are not far from Chillenden Mill, they’re a couple of hundred yards off to the NE. Admiral D’Aeth was at Knolton in 1868, so would have had the windmill built. I’ve obviously made a mistake in saying that the mill was part of the Goodnestone estate. Matters were a bit complicated at times in the Rowling and Chillenden area with ownership constantly changing over the centuries. The Hammonds of St. Alban’s Court held a lot of the land, as did the D’Aeths.The mill was sold by the Speeds, who acquired the Knolton estate around 1900, to the KCC in the 1950’s. Agreed on all of that. Stump mill is a term used for an open trestle post mill. I’m confident the previous mill was an open trestle post mill presumably painted white, and its replacement was the same (to keep the view! ), with a few modern variations to bring it up to speed and at least make it pay its way. A man from Nonington, who sadly died last year, was best friends with the last miller’s son, and he told me that he and the miller’s son often had to cut short bike rides and other expeditions when the wind changed. They had to go to the mill and manually turn the mill to face into the wind. Somebody always had to be available to do this when the mill was working, which often made life difficult for Norman Laker and his son. The mill at Chillenden stopped milling about four years before the Easole mill in Nonington. The mill is in an exposed position, and has always been a bit ‘headsick’, so unbalanced a bit and vulnerable to tipping or ‘tailwinding’ from behind if caught by a gale. Something similar to this happened in 2005. As for Easole mill, I knew a couple of people that went in the mill shortly after it stopped work, and I have one or two photos. It was one of the earlier Kentish smock mills in an area where they started evolving, but there was considerable and regular investment in keeping it up to date. Other notable early ones were at Eastry (1743), Northbourne (1739) and Chislet (1744). The mill could have been 200 years old+ when it burned. The last Easole corn mill first appears in the parish vestry records for taxes [poor rate and church taxes]in 1784 where the miller is recorded as Richard Downing, so presumably was built just before this date. The following year Stephen Pain was recorded as the miller. The Easole pug mill also first appears in the parish records in the 1780’s, where Robert Rodgers was followed by his widow as millers until 1798.There must have been some economic reason for building mills in Nonington during the 1780’s. The two Barson [Barfreston] mills which were less than half a mile to the SW were also operating at this time, closing in 1821. The Barson mills and the Easole cornmill were owned by the Plumptres of Fredville. I’m just wondering where this information came from, as I always understood it was built at Chillenden. The information was given to me by someone who helped the last miller just after WW2. He told me that he was told that parts of the mill were from a previous mill on the site and from other wind mills. It looks like I’ve made a mistake in writing the item, for which I did the research some ten or twelve years ago and have not revised recently. Thanks for pointing out my error.